Loockermans arrived in New Netherland as a teenager and achieved great status and wealth as a merchant and “founding father” of New Amsterdam. 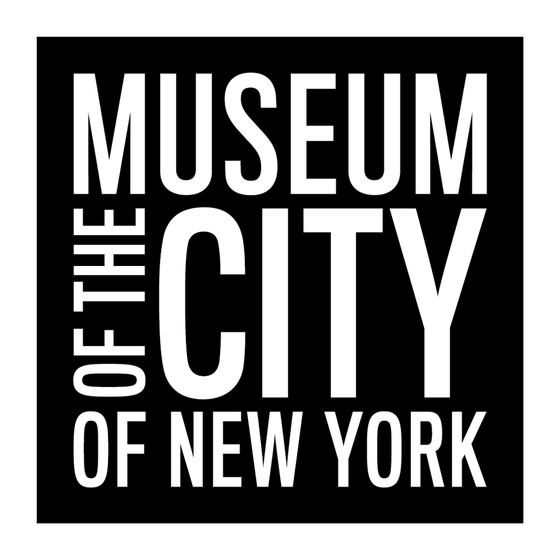 Episodes from his life appear in the records of both the NYC Municipal Archives and the City of Amsterdam Archives. A selection of episodes is excerpted below. Some questions to consider about Govert Lookermans. Govert Loockermans appears in the will of his sister, Margrieta Loockermans. The will states that he lives in the town of Turnhout, where he was born. It also indicates that he is the guardian of his niece Anneke, daughter of his brother Jacob. Jan Willemss Loosdrecht returns to Amsterdam from New Netherland aboard the vessel De Waterhondt with a bill of 30 Carolus guilders, dated 1638. He transfers this bill to Govert Loockermans who happens to be on the same ship back to Amsterdam. Govert Loockermans and Cornelis van Wensveen sign a declaration acknowledging that they have sold to George Cleer a piece of land on Manhattan Island on the East River at the point approaching the marsh called “Wolphert’s Valey.” An amendment is made conveying the land to Thomas Stevens on 23 July 1653. The owner of the ship de Valckenier, Gilles Verbrugge, appoints Govert as chief merchant. This allows him to trade along the coast and the rivers of the Dutch colony in name of the Dutch West India Company. His salary is determined in this document: he will earn 60 Carolus guilders per month. He also becomes partner of the company, acquiring a share of 12.5% for which he pays 1000 Carolus guilders. Govert is about to leave for New Netherland again. He leaves property behind in the Netherlands, including cattle that need to be looked after. He employs a certain Dirk Jansen from Rotterdam to look after the animals and manage his land. 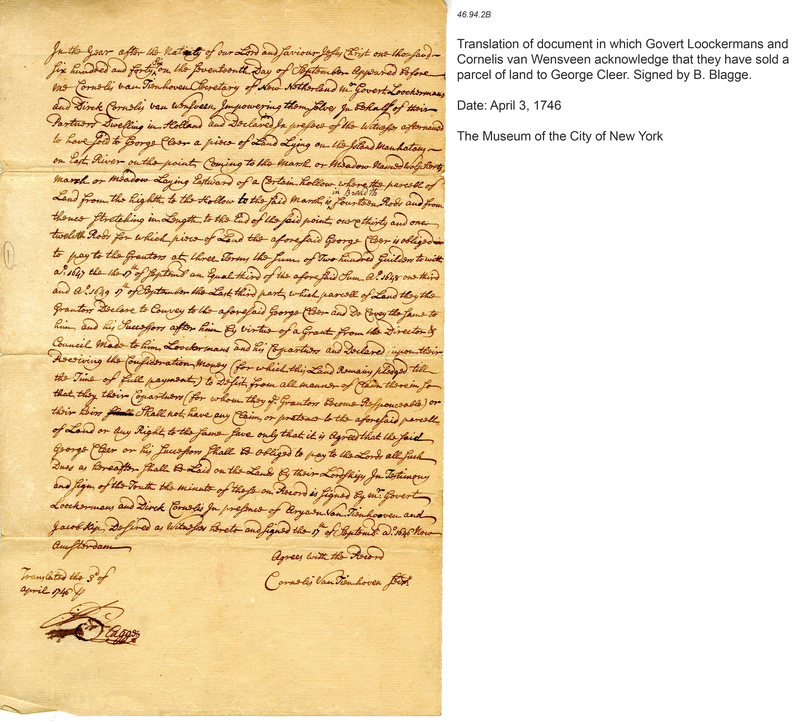 A group of merchants, including Gillis and Seth Verbrugge, conclude a contract in Amsterdam and authorize Govert Loockermans to sell cargo in Manhattan, New Netherland. Govert Loockermans declares that “about eleven years ago” he bought a parcel of land on the Varsche River (today called the Connecticut River) from director Willem Kieft. He also declares that half of this piece of land, the Bestevaers Kreupelbosch (or: “the Old Man’s Swamp”), became property of Gillis and Seth Verbrugge in 1651 after a sale. Following a discussion about a possible coming attack from the English colonists to the north in New England, a list is made of some 40 burghers who shall provisionally contribute the sums set against their names for the defense of the City. The amounts range from 50-200 guilders. The amount Loockermans will give is 150 guilders. A total of 5000 guilders is raised. Govert Loockermans conveys to Thomas Stevens of a piece of land located on Manhattan Island on the East River at the point approaching the marsh called "Wolphert's Valley." Govert’s stepdaughter Elsie and her husband Pieter Corneliss van de Veen also live in New Netherland. Van de Veen hires Christoffel Hoogelandt to assist Govert by performing trading duties, but not agricultural work. According to the contract he is to receive a yearly salary that increases over time, as well as an ocean crossing to New Netherland. A resolution is made to repair and strengthen the plank curtain (wall) protecting the city from the native Indians. There follows a list of local inhabitants and the amounts pledged by each one. Loockermans pledges 100 guilders. Loockermans appears in court about a scow (a type of boat), grapnel, and rope he rented to Aert Willemsen; when the scow was returned the other items were missing. Willemsen says that when the scow was anchored off Beaver Path, it was taken by the crew of The Shark, and when he next found it the grapnel and rope were missing. On 24 January, the court finds for Loockermans, ordering Willemsen to restore the missing items, or pay their value as determined by arbitrators. Govert Loockermans, Hendrick Kip, and Christian Barentsen are appointed Fire Inspectors by the Burgomasters of the city, with the approval of the Director General and Council. They are authorized to visit at their convenience all the houses and chimneys in the city, make orders for prevention of fires therein, and see the orders executed. The Heer (gentlemen) Govert Loockermans and Nicasius d’Silla are elected Churchwardens for a term of one year. They will attend to needed repairs for the Church. This deed, in which an authorization is given to collect a debt of 200 guilders, appears to be the last record of Govert in the Stadsarchief Amsterdam. While handling Govert’s cargo, Istbrandt Goethart incurred this debt, which may now be collected by Johannes van Vijver. Loockerman’s wife Merritje appears in court regarding the estate of Pieter Cornelissen van der Veen, late husband of her daughter Elsie. The Board informs Merritje that Loockermans and Aldert Coninck have been appointed administrators of the estate. She asks that her husband be excused from the assignment, “to avoid all suspicion against him among the friends in Holland.” The court grants her request. A group of 100 burghers and residents agree to make a loan to the city for the colony’s defense from the English, in exchange for the Director General and Council giving over the excise on beer and wine. It is specified that the loan must be repaid at 10% interest within five years. Govert Loockermans pledges 500 guilders for the loan. The court resolves that the townsmen of New York should be listed and divided into two bands military, and appear in arms upon the departure of the right honorable governor, Richard Nicolls. The court chooses Marten Kregier and Johannes van Brugh as Captains, Govert Loockermans and Jacob Kip as Lieutenants, and Stephen van Cortlant and Daniel d’Houdecourt as Ensigns. Balthazaer Bayard and Hans Kierstede, husbands of Govert Loockermans’s daughters Marritje and Jannetje from his first marriage, appear in court regarding the settling of the estate of their late father-in-law. Loockermans’s widow Marritje requests a delay until the return of her son-in-law Sir Jacob Leyslar. The court grants a six week delay. 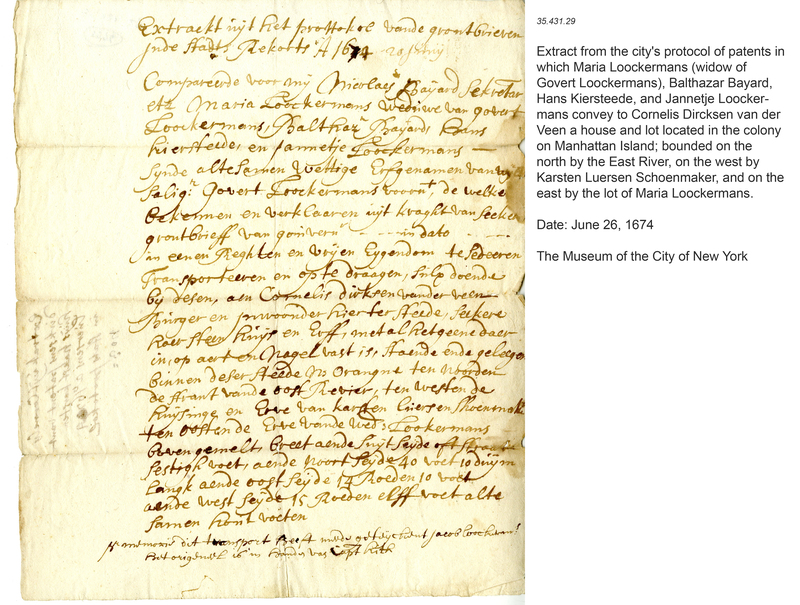 As documented in this extract from the city's protocol of patents, Maria Loockermans (widow of Govert Loockermans), Balthazar Bayard, Hans Kiersteede, and Jannetje Loockermans convey to Cornelis Dircksen van der Veen a house and lot located in the colony on Manhattan Island; bounded on the north by the East River, on the west by Karsten Luersen Schoenmaker, and on the east by the lot of Maria Loockermans. Historian Willem Frijhoff has referred to Govert Loockermans as a “vigilant, cunning merchant,” a “ruthless pioneer,” and an “icon of a Wall Street capitalist.” To what extent would you agree or disagree with Frijhoff? Govert Loockermans's rise to prominence as a New Amsterdam merchants was influenced by his connection to the Verburgge family of Amsterdam merchants. How would you describe this relationship and how did it change over time? While residing in Manhattan, Govert Loockermans seems to have been a responsible, active, engaged citizen of New Amsterdam. To what extent was this true? Consider the positions he held in city government and his “voluntary contributions” to the city.